This is a very unique and early example of a Guild STARFIRE Bass. Guild was late to the Electric Bass game and did not introduce a Bass Guitar to their product range until the "Solid-Body" JETSTAR was introduced sometime in late 1964, but production examples were not seen until 1965. Compared to the other major U.S. instrument manufacturers, this was rather late since Fender, Gibson, and Rickenbacker all had Bass models dating back to the 1950's. The Starfire Bass was introduced sometime during 1965 and it took a little time for the dealers to get inventory and sales to get going as it was an unknown model. These likely didn't emerge until very late 1965 or early 1966. According to records, only 76 basses were made the 1st year and this is one of the original models with the early, 1st generation pickup. Coupled with a late and slow start and a quick production change to the larger Bi-Sonic pickup, it is easy to understand why an early-feature model like this is VERY seldom seen. The factory list price in 1966 was $350.00. These early, 1st variety Starfires were fitted with a small, single coil, Hagstrom-made pickup from Sweden, whose bridges were also utilized. This "small pickup" Starfire bass is a very short-lived, likely just several months model. After it was introduced in late 1965, it continued partially into 1966 when shortly thereafter, the switch was made to the larger; also Hagstrom made, "Bisonic" Single Coil pickup (though the catalog called them "humbucking"). When the 1966 Catalog, the first to show the SF Bass was printed, the SF Bass was already sporting the larger pickup. The usage of the larger pickup continued until Guild introduced a U.S. made Hum-Bucking pickup, circa 1970-1971. An eye-pleasing Cherry Red finish has been applied to a Mahogany veneer that has gently and naturally aged, the Red hue has only slightly faded, displaying a warm and inviting vibe. 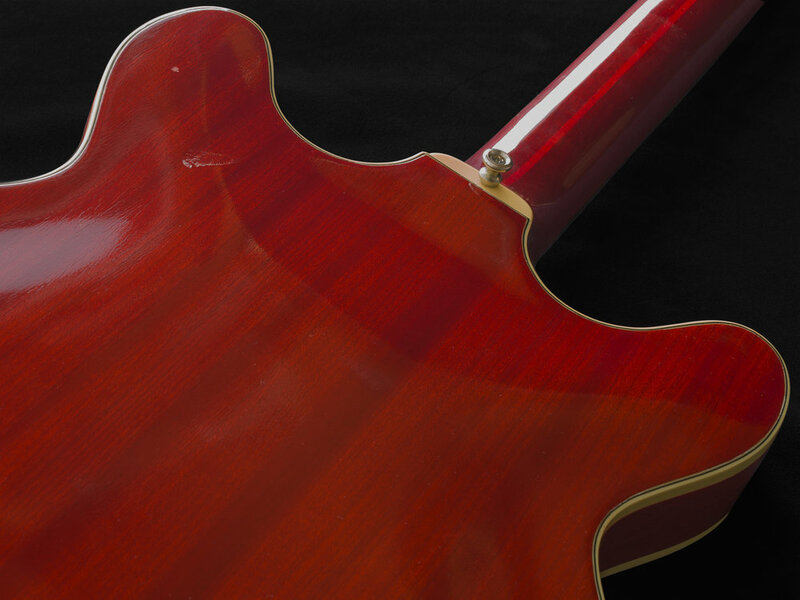 Guild typically chose and used (striped) Mahogany veneers on the instruments they designated to receive a Cherry Red color, while their Sunburst finishes were typically applied to Maple veneers. Being a light colored wood, Maple worked out better for the brighter sunburst finishes, and like many instrument manufacturing companies of the day who were scrambling to meet production deadlines and fill orders, occasionally this rule did not apply. This bass also features a Mahogany neck with wood sourced from PERU, topped with a Rosewood fingerboard with Dot inlays and the now iconic and very regal "Chesterfield" headstock logo, finished off with an aluminum Starfire-designated Truss Rod cover. They sure do NOT make them like they used too! I have examined, tested, serviced and set-up this instrument and found it to be factory-correct and unmolested in every way. All of the electronics, frets, nut, tuners, finish, and both the plastic and chrome plated metal hardware are all correct and original to the bass. This bass shows minimal signs of usage as it was sparingly played long ago and was then purchased and stored by me, until today. Globally it displays some very minor marks, but there are no major cosmetic or any structural issues to notate. The back of the body has a few minor impressions, and small marks, but it's all minimal. The Bass comes with the Original GUILD Hang-Tag / Warranty Card, an era-appropriate Vintage Cable and a very nicely made Skinny Black Leather Strap with cushioned Shoulder Pad, all of which came to me with the Bass and I am offering it exactly the way that I got it decades ago. The CASE is the Original Guild Plush-lined hard shell and is in matching, excellent condition with a functioning handle, latches, and hinges. The bass has a set of Vintage Flat Wound STRINGS, which appear to me to be the original factory-installed set. There is NO reason to change them, they feel great and the intonation set up very well, the 52 year old strings help make the Bass as amazing as it is (read on). Not only is this early feature Starfire Bass rare, it is even more scarce to find one in such well preserved, uncirculated and beautiful condition. I acquired this bass from a talented local LA producer/bassist friend about 25 years ago while running my Vintage store. Because of its beauty and allure, I decided not to offer it for sale and it subsequently never made it onto the walls of my shop and ended up in my collection. I had a magnetic attraction to it. The bass is now 52 years old and has been safely stored since acquiring it and has subsequently been spared all of the "circulation" that most instruments being offered online today have undergone. If you find this model as interesting and inviting as I do, the chance of finding an early Starfire example of this caliber may not be easy. This Bass is very clean and crisp and has NOT had any repairs, parts restoration or any modifications, it is still Factory-Original, and the frets remain in excellent condition as the bass has very low mileage. Vintage Flat Wound strings make some heavenly bass sounds, and to me, this is a very special instrument in many ways! In the right hands, this could be a recording studio "Secret Weapon." No round-wound should ever adorn this bass, in my opinion, that would ruin the vibe of what this vintage 1960's relic is about, Punchy Flat Wound Power!